I am looking to identify this plant. It originally started without the tall stalk, but just keeps getting taller. This is a Yucca Plant. 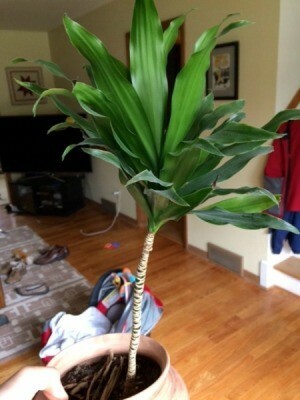 Go to www.gardeningknowhow.com/.../growing-yucca-indoors.htm for more information on the various types. These are actually wild in California. We even named a valley Yucca Valley in the plants honor. You can find much info on the web. They are very similar to cacti in soil and water requirements so read up on the care and history and uses for them both past and present. Enjoy your yucca.